Jonathan is ready to start school, and he is thrilled to be taking a school bus driven by a man who looks just like the milkman he knew when he lived in the city. Over the course of the year, Rus, as the children call the driver, proves to be a dedicated friend to the children on his route, as he rescues a birthday cake, saves kids from a snowbank, transports pets, and even takes the class out to select a Christmas tree. 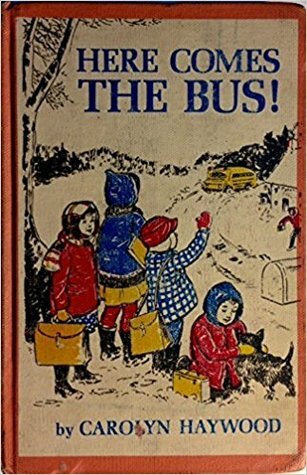 Carolyn Haywood wrote a lot of books about school, but this one stood out for me because it revolves around not the school itself, but the school bus. I lived so close to my elementary and middle schools growing up that I only took the bus in kindergarten and in high school, and there was always an air of mystery surrounding what actually happened during those bus rides to and from school. As a kid, this book would have been fascinating to me for that reason alone. What I enjoyed about it now, as an adult, however, was the character of Rus himself. While all of the characters of the story are well-developed, and the kids act just like a classroom full of first graders would act in real life, there is something especially endearing about a bus driver who goes to such great lengths to make sure his riders have a good year in school. That's not to say this is a book that goes out of its way to hold up Rus as a hero - instead, it winds up being an interesting look at the work of a bus driver with a focus on all the little details that are especially fascinating to young kids. Just as she does with Mr. Kilpatrick, the crossing guard in her beloved Betsy series, Haywood creates in Rus an adult that kids can admire and relate to at the same time. Here Comes the Bus! would be a perfect back-to-school read-aloud for families preparing to send a child on the bus for the first time, or for teachers hoping to break the ice at the start of the school year. It's also a good choice for a transportation-obsessed preschooler who is ready to hear chapter books, as the bus is the main setting of all the action.